“And like flowers in the fields, that make wonderful views, when we stand side-by-side in our wonderful hues..
What an incredible adventure retrospection is! One doesn’t simply go down the memory lane, but brings the lane to one’s present and witness it not-so-surreptitiously alter it! I assure you, by the time I had finished writing this blog, my present and past had been reshaped, already. 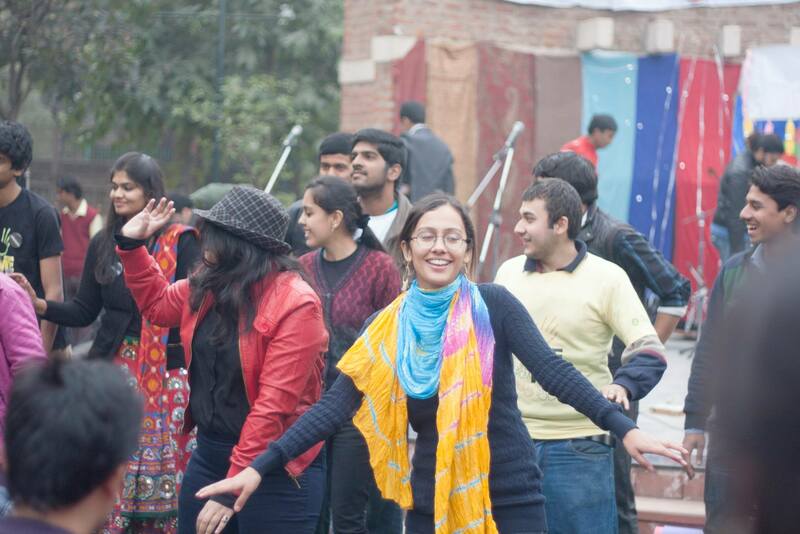 On 25th January 2014 Pravah celebrated love, peace, and harmony in the form of a day long (youth-led) musical adventure- Music For Harmony (M4H). Dilli Haat proved to be a vivacious venue bringing people from different walks of life to join us in the journey. It was fun-frolic, magic-music, dance-drama, exuberance-excitement (sans ability-to express), bakbak-batchit, and amazement-applause. This is how it must have looked from the outside. Notwithstanding all of this, M4H is too awesome to be restricted to that. What else? From the conception of the idea, willing participation from all of us, laying out a (ever-changing) plan, division (and re-division) of roles and responsibilities, numerous meetings, phone-calls, emails, pakoras-jalebis-burgers-tikkis, budgeting, venue-booking, NOC, decoration, posters, invites, mementos, photos, performances, sound-lighting, logisitics, compeering, mobilisation and so on to all the off-stage effort on the day of the event. M4H isn’t (just) about that either. M4H was not an event but a process that we lived through. It was a story that each one of us will tell differently, but inconceivable without each other. This one is my story. Meanwhile, while you are reading it, you have become an indispensable part of this journey. Welcome! Let’s take a dive into the pensive. “So why are we doing it- young people coming together putting up a tableaux of music and dance?” I asked, myself. “To celebrate the spirit of peace and harmony through music”, I contemplated. “Yes, but what will it entail? Will the message be conveyed? How will it be ensured that it doesn’t just become another programmethat people enjoy only to go back to life-as-usual?” I was puzzled as I pondered over the challenge. Then it dawned upon me. “Hey! Why am I so concerned about making ‘them’ believe in it? Do I myself believe in the message?” I had not inserted myself into the process till that time, only if I had, would I have realised that it no longer was the (changed) lens I was wearing, it had become my eyes. It did generate a ripple, at least inside my own ocean. The fact that around 30 young hearts and heads invested their lives for over a month (I joined in late December), with each other, working out of their way, to make it happen was an achievement in itself! (United excitement is not a prerogative of a clarion call for the war or cricket as many would like us to believe!) Not denying that we did it probably for ourselves, as we all had goals and expectations, they acted as threads weaving into a fabric of M4h. And the embroidery had to be beautiful. So I realised that our ambitions do not necessarily put as in competition, they often bring us together. A crucial lesson for life. Those were the days of anxiety and nervousness but of alexanderian pursuit and hope too. We had all endeavoured faith in ourselves and each other. Somehow I knew we would pull it off. Prudence and optimism are more than just acquaintances. I loved (now in retrospect) the way everything had to go through channels of feedback and approval (I do not deny that it irritated me at times). A second and third opinion may be better than a coast guard when you are (consciously or unconsciously) about to sail into a turbulent ocean. M4H gave me friends, with new bonds struck, as I met wonderful people, and old ones got stronger as they supported and appreciated me in my efforts (and finally joined on the day of the event). The tension never overtook the sense of joy and jubilance of doing it. The relations that I built here, and satisfaction that I gained, percolated into other relationships with friends, family, and most importantly myself. I have always been somebody who derived energy from interacting with people. But each day spending time walking along seemingly impervious ring road (in the university campus) witnessing wonderous canopies waving at me, listening to the breeze whispering words of wisdom into my mind I started to realise I wasn’t a bad company! Each day I asked myself, ‘why am I doing it?’ only to hear my heart sing, reassuringly, ‘it makes you happy’. I realised my potential, strengths and weaknesses both as a leader and a follower. I learnt how important building relationships of trust is. People stepped out (excitingly or reluctantly) of their comfort zones. At times, so willing they were to be uncomfortable that I wondered if, at all, that was ‘uncomfortable’! I had always felt impatience to be a more frequent visitor but perseverance pleasantly surprised me. I found myself multi-tasking that too without really giving into fearing to fail. Creativity had become the definitional attribute of the space. I had often felt experiencing ‘the room of requirements’ of Harry Potter kind where people would unleash skills and prowess to awe inspiring levels! It was magical but never unreal. I shall never forget those dance practices. The room was too tiny to either practice or execute. Notwithstanding this spatial limitation we made it! Doing flash-mobs in the Pravah office and in Dilli Haat is as vivid in my imagination as the last the second that passed by. It was one of those journeys which, sometime in future, the old me will narrate to young kids (or adults!) some evening(s) in a park, each time with a tinge or bout of modification. Blimey! I have romantically engaged in retrospection and pulled you in with me. Story telling is indeed a graphical medium of self-reflection. I have neither written an epilogue, nor did I intend to provide a panoramic view of M4h. I held a kaleidoscope, as I continue to do so. And that is what I offered you to peep into. It was pleasure having you along. Hope you enjoyed it! Astha Agarwal is a Youth Facilitator and Volunteer at Pravah. During the Music for Harmony event she provided much energy to the performers, fellow staff and all of the audience as she served as a co-mistress of the ceremony.